TigerBlog is wondering how many people who will be at the football game Saturday on Powers Field at Princeton Stadium between 7-0 Princeton and 7-0 Dartmouth were also at the 1993 game at Franklin Field between 7-0 Princeton and 7-0 Penn. Whatever that number is, TigerBlog was one of them. That game, as you've probably heard by now, was the last time Princeton reached this point of the season unbeaten with a game against a fellow unbeaten. The last time that happened in the Ivy League was in 2001, when 8-0 Penn played 8-0 Harvard, also at Franklin Field. TB was not at that game, a 28-21 Harvard win. He'll get back to football shortly. First, as TigerBlog has said many times before, among his retirement goals is to someday be known as "that nice old guy who's always out walking his dog." By his beach house, of course. He envisions a medium-sized dog, by the way. Not some giant dog. Earlier this week TigerBlog mentioned his colleague Macall Martin and her dogs. They are the biggest dogs there are, at least he thinks they are. The first time he wrote about them, he called them "Great Danes," but then he wasn't sure he should capitalize the "G" and the "D." Actually, it looked correct, but then he thought maybe that was because he's seen the University at Albany written about so often. The Albany Great Danes. As it turns out, the dogs are also Great Danes, not great danes. But cockapoos are just cockapoos and poodles are just poodles, not capitalized. TigerBlog has always been great at grammar, but not as great at spelling and, apparently, capitalization. He also was never really great at remembering what all those other words about words meant. You know? Like what are two consecutive words used together that have opposite meanings? Like "deafening silence." Those are oxymorons. Onomatopeia refers to words that sound like their meaning, such as "crash." He never can keep those straight. Then there are homophones. Those are two words that are spelled differently and mean different things but are spelled the same. Like "hear" and "here." TB will now demonstrate in a sentence: Courtney Banghart, the women's basketball coach, talks about, among other things, how long it took her to go from being a Dartmouth athlete and coach to being all in on Orange and Black in the current episode of "The Court Report" podcast, which you can hear HERE. TigerBlog's own timeline went from being a Penn student to a Penn fan to someone who covers Princeton somewhat objectively to someone who rooted for Princeton to someone who works at Princeton. He started rooting for Princeton somewhere very shortly after he started covering Princeton, long before he started working here. It was definitely all completed by that 1993 football game. Actually it was completed a few years before that, possibly the first time TB interviewed Bob Surace, who was then a center for the team and who now is its head coach. Back at the 1993 Princeton-Penn game, TigerBlog remembers a lot about that day, and the week leading up to it, for that matter. There was a great deal of hype leading up to the game, as much as any game that TB can remember. He certainly did his part, writing about it every day the week before in the Trenton Times. Back in those days, Princeton had a weekly media luncheon for each week of the football season. TB isn't exactly sure when those stopped exactly, but it was maybe 10 years or so ago. He does know that in all the ones he went to, the one before that Penn game was by far the most crowded. As for the game, Terrance Stokes, who went from Trenton High to Penn, set the Quaker single-game rushing record, going for 272 yards on a rainy day in a 30-14 win by the home team. Princeton never really got into a rhythm in that one and seemed to be a step off the whole time. Stokes had the most statistically wild game TB has ever seen, with 136 rushing yards in the first half and 136 more rushing yards in the second half. Why talk about all this now, other than the fact that it's the last time Princeton had a game like this one? That game has nothing to do with this one. Not one of the players who will play Saturday was even all that close to being born yet in 1993. Mostly, the game coming up Saturday got TB thinking back to the build up to that 1993 game. It was, as he said, unlike the build up to any other game he's seen with Princeton football. Much of that can't be repeated, not with what's happened to the newspaper business, for instance. This week there will be videos and social media posts by both schools, a sign of these times as much as the media lunch was a part of those times. But the emotions are the same. There's this huge game at the end of the week. Each day it gets a little closer and the energy continues to build for it. In that respect, it's 1993. Maybe TB would remember it differently had Princeton won that one. Maybe not. Either way, what he remembers most about that game is how exciting it was to have an event like that. The feeling right now, still a few days out, is the same. Ross Tucker, the Princeton alum and current football media star, tweeted something interesting yesterday. Ross, a TigerBlog favorite, was a longtime NFL offensive lineman. He mentioned that his last snap was in 2007, and yet he had been a teammate of both starting quarterbacks in last night's Monday Night Football game - New England's Tom Brady and Buffalo's Derek Anderson. That's interesting, especially since it's 11 years later. There can't be many players who last played in 2007 who were teammates with two current NFL starters. In other NFL news, the Giants are the worst team in the league and TigerBlog is fine with that. Oh, and it's not Eli Manning's fault, so don't blame him. Maybe the team needs to see what it has with rookie Kyle Lauletta, but it's hardly Eli's fault that the team is awful. And Taysom Hill continues to be the most exciting player in the league. And Pat Mahomes is really, really good. Will it be a Chiefs-Rams Super Bowl? Speaking of football, you're probably already aware that their is a huge game coming up on Powers Field this Saturday. It'll be 7-0 Princeton and 7-0 Dartmouth in football, with kickoff at 1. The game features the only two people in Ivy football history to win championships as both players and head coaches - Princeton's Bob Surace and Dartmouth's Buddy Teevens. As TB said, it's a huge game Saturday at Princeton. It's just that it's not the only huge game at Princeton Saturday. In fact, there are a lot of them, as it turns out. The day starts with field hockey, where Princeton hosts Penn, hoping for a win and a Harvard loss to Columbia to get a share of the league championship. Harvard, regardless, will have the league's automatic NCAA tournament bid after its win over Princeton, but the Tigers - with wins over teams like UConn, Penn State and Duke - is a near lock for an at-large bid. The football game will not decide the league champion, at least not right away. The winner of that game will still have two more to go, so the loser is not eliminated. There is a championship game of sorts that will be taking place Saturday evening, as the second game of a soccer doubleheader with Penn in which both ends will have major championship implications. The women's game starts at 7, and when it's over, the Ivy League's automatic bid to the NCAA tournament will belong to one of the two teams. Penn is currently 5-0-1 in the league and has clinched at least a share of the league title, but Princeton is 4-1-1, which makes the math relatively simple here. Princeton can obviously tie Penn with a win, which would leave both at 5-1-1. If that were to happen, Princeton would get the league's automatic bid to the tournament by virtue of having defeated Penn. On the other hand, a Penn win or tie means an outright title - and the NCAA bid - for the Quakers. By the way, Penn and Princeton rank 1-2 in the Ivy League in scoring offense and scoring defense. The Quakers have allowed just four goals all year, including just one goal in the last 10 games. In fact, Penn gave up two goals in a 4-2 win over Navy and two in all of its other games combined, including one in the Ivy League (against Yale). That's the challenge for Princeton. Win and advance. Lose or tie? Then it's hope for an at-large bid that, with an RPI that will be around 30, is very much up in the air. The men's soccer race is a week behind the women's, which means that there are two games to go. Princeton sits alone in first place with 13 points at 4-0-1, after huge wins against Columbia and Cornell, including 2-0 over the then-22nd-ranked Big Red in Ithaca this past Saturday. Columbia right now has 12 points at 4-1-0, followed by Cornell at 3-2-0 (nine points) and Dartmouth at 2-1-1 (eight points). The other four have been mathematically eliminated. Princeton plays Penn at 4 Saturday and then travels to Yale next Saturday. The simplest formula for the Tigers is to win both, and they will definitely win the championship. There are all kinds of other combinations that get Princeton to the finish line, including going 1-1 in the last two if Cornell beats Columbia in their season finale. On the other hand, two Columbia wins (the Lions are at Harvard this weekend) would mean Princeton would have to win its last two to win the championship. So that's your Saturday menu of on-campus Ivy events. Four of them, with all four directly impacting championships or postseason. Yeah, maybe TigerBlog will have a little more on this as the week goes along. The "Beat The Tiger" promotion on the Princeton Stadium videoboard Saturday asked the question of how many different Halloween candies you can name? The contestant came up with 19. The Princeton football player on the board came up with 10 or so. Contestant wins. Up in the PA booth, TigerBlog and his colleague Macall Martin talked about their own favorites. TigerBlog mentioned the wildly underrated mini-Three Musketeers bars, not to mention Kit Kats and peanut butter cups. TB pointed out to Macall that he doesn't like peanut butter but does like peanut butter cups, and she said that she thinks that's a common phenomenon. She also said she's okay with peanuts but not walnuts. At one point, Senior Associate Athletic Director Kellie Staples came by with a bunch of candy, but more the fruity kind than the chocolate kind. TigerBlog definitely prefers the chocolate kind. The Princeton Stadium music director is DJ Darius the First. TigerBlog knew him first as Darius Young, who was a great three-sport athlete at Princeton High School back when TB covered high school sports. Darius was in the booth next to TB and Macall, and he wandered over to grab some of the candy. There were other conversations too. TigerBlog told Macall the story of his friend from freshman year at Penn who came back from a class one day and announced that he'd met the woman he was going to marry - even if he didn't know her name yet. Oh, and it turned out that they had the same last name. And oh, they ended up getting married. Macall talked about her husband and their two Great Danes. And how she used to work at Oregon State. Later on Macall's fellow marketing staff member Thelma Hughes came up. It was like a little party up there. As for the game on the field? Well, like each Princeton football game on Powers Field so far this season, there really wasn't much drama there. Nope. For the fourth time this year, Princeton put away its opponent early, leaving only the final score to be determined. There hasn't been a dramatic moment beyond the middle of the second quarter or so. And all that will change with the fifth game on that field this year. That one comes up Saturday at 1, when 7-0 Princeton and 7-0 Dartmouth meet. It won't decide the Ivy League championship yet, not with two weeks remaining, and it'll be tough for whoever wins to come back the next week. The game after the big game is never easy. Still, this is the first time in 25 years that there's been a matchup of unbeaten Ivy teams this late in the season involving Princeton and second time overall, after unbeatens Penn and Harvard played late in 2001. A look ahead to the weather forecast suggests 57 and sunny, which would be just perfect for a game like this. There will be plenty of time to talk about the game coming up this week, and TigerBlog definitely will be doing that. First, though, there was the matter of Princeton-Cornell from this past Saturday. The final was 66-0 Princeton, which made it the most points Princeton has ever scored in an Ivy League game. It also makes it the second time in four home games this year that Princeton has scored 66 points, after a 66-7 win over Lehigh earlier this year. What does that average out to? Princeton 33.5, Opponents 4.0. Against Cornell Princeton led 21-0 after first quarter. By the end of the game, Princeton had outgained Cornell 504-243, with 358 of those yards on the ground. Princeton had 13 drives against Cornell and nine of those ended in touchdowns. The first half drive chart went this way: punt, TD, TD, TD, TD, TD, TD, FG. The best part about this Princeton team is that it's so balanced. The Tigers can beat you in a lot of ways, on both sides of the ball. There's depth, especially since the starters have rarely played into the late third quarter, let alone the fourth. The result of all of this has been seven straight wins, with very little in the way of drama. The game at Harvard provided some, but Princeton never trailed and was mostly in control in a 29-21 win. Week 8 will be completely different. There may be 66 points scored, but they won't all be by one team. No, these are two teams that have put themselves in position to play a game like this. Dartmouth, like Princeton, hasn't really come close to losing yet this year either, with the closest game also Harvard, this past Saturday, by a 24-17 count. It's 7-0 Princeton and 7-0 Dartmouth. The drama is on its way to Powers Field. TigerBlog has been trying to remember something all week, and for the life of him he just can't. His memory is one of his strengths. For whatever reason, he can rattle off high schools and hometowns of Princeton athletes from when he first started here, nearly 30 years ago. Even this week, he was asked what high school Jason Doneger, a lacrosse player from the Class of 2005, attended, and TB replied "Lynbrook, of course." Final scores of games. Stats. They all are in there, floating around, waiting to be recalled at a moment's notice. Hey, he can even give you all of the Presidents in chronological order, in addition to all of "The Cat In The Hat" and pretty much every line from "Casablanca." And yet this week, there's just been something he can't remember. So yeah, what was it? Was it something he's been meaning to talk to you about? Was it Heps cross country, coming to Princeton tomorrow morning? No, that wasn't it. Princeton's West Windsor Fields will be the site for the Heps cross country championships, with the women's race at 11 and the men's race at noon. The winners of each race will be crowned the Ivy League champions of 2018, the first teams to earn championships in this academic year. Of all of the events on the Ivy League sports calendar each year, there are few that TigerBlog likes more than Heps cross country. The atmosphere is that of a big party, with tents and alums and fans of all eight schools there for the start and the finish. And the competition is intense. It's not just about who wins the individual championship. It's about the runner in 15th who nudges past two others to get to 13th and dramatically change the team outcome. Both Princeton teams are ranked this year nationally, and both will be very much in the hunt this time around as well. So no, that wasn't it. Was it Ivy League soccer? No, TigerBlog talked a lot of about that earlier this week. Both Princeton teams are in Ithaca to take on Cornell, and both of those games are huge as both head there knowing that they will win an Ivy League championship simply by winning out - the women with two games left and the men with three. Football? Well, TB hasn't really talked much about that this week, but he knew he'd be bringing it up today. You can go to the Heps races and then head over to the football stadium, where Princeton and Cornell kick off at 1. Just as the Princeton soccer teams know that they'll win a championship by winning out, so too do Princeton's and Cornell's football teams. As you are probably aware, Princeton and Dartmouth are both 6-0 with four weeks left in the season, and they meet next Saturday on Powers Field. What you might not also realize is that Cornell is 2-1, with only a league loss to Yale and wins over Harvard and Brown. Yale is also 2-1 in the league, but if Dartmouth wins out, Yale cannot get a share of the championship. That leaves Princeton, Dartmouth and Cornell as the only teams that can win a title without any help, and those three all have the other two on their schedule the rest of the way. By the way, as TigerBlog has said before, he's never been a fan of when people say teams "control their own destiny," since nobody controls destiny. It's destiny, so it's going to happen no matter what. Princeton and Dartmouth rank 1-2 in the league in scoring offense (Princeton first, Dartmouth second) and scoring defense (Dartmouth first, Princeton second). Cornell is fifth in offense and seventh in defense. In fact, Cornell doesn't rank in the top half of the league in scoring offense, scoring defense, total offense, total defense, passing offense, passing defense, rushing offense or rushing defense. You know what that means? It means Cornell is a dangerous team. Its numbers don't jump off the page, but the Big Red has learned to win. Cornell was 4-18 in a 22-game Ivy stretch from 2014 through an opening loss to Harvard last year. Since then, Cornell is 5-4 in its last nine league games, one of which was a win over Princeton last year. Princeton is coming in off five blowout wins to start the year and then one last week that the Tigers had to tough out before knocking off Harvard 29-21. It was the kind of test Princeton figures to have more of in the last four weeks of the season, beginning with tomorrow's game. In other words, it'll be two teams playing to put themselves in championship position tomorrow, with kickoff at 1 on Powers Field. Maybe by then TB will have remembered what it is he forgot. What was it? Yeah, it'll come to him eventually. Welcome to the early days of crossover season. There are two of these each year, the fall/winter one, which is a bit daunting, and its evil cousin the winter/spring one, which takes daunting to another level. These are the toughest times for those who work in college athletics in any capacity. There are teams playing for championships and other teams starting out their seasons, and they all have needs from everybody, such as athletic trainers, the equipment staff, the event staff, marketing and even communications. Each year it seems that the seasons overlap a bit earlier. Of course it's great when you have successful teams, even though that makes the crossover last a little longer. TigerBlog recently did a fall podcast with Chris Sailer, the women's lacrosse coach, which you can listen to HERE. During the podcast, Chris talked about how fall lacrosse has changed for her program in her time here, which was very interesting, but she also mentioned how her team is getting ready for its opener, which will be Feb. 16 at home against Temple. At that point TB mentioned that the season used to start on March 1, and Chris said that it actually used to start on March 15 at one point. In addition to home women's lacrosse that day (the men open their season Feb. 16 but at Monmouth), the men's basketball team will be home against Dartmouth, after hosting Harvard the night before. That will be Princeton's third of six Ivy League weekends in basketball. That should give you a sense of what the crossover is like. It's not as long or with as many teams in the fall/winter, though it certainly gets busy enough. It started last weekend, when the women's hockey team opened its season with a strong showing at No. 2 Wisconsin, falling 4-3 and 3-0 to a team playing its fifth and sixth games. The women's hockey team is home this weekend, playing if you can believe it, the first ECAC weekend of the year with games tomorrow against Yale (6) and Saturday against Brown (3). In true crossover fashion, your weekend of home events includes those two games, Week 7 of the football season (Princeton vs. Cornell at 1 Saturday) and Ivy League Heptagonal cross country championships (Saturday, with the women at 11 and the men at noon). The men's hockey team opens its season tomorrow night as well, traveling to Penn State to take on the Nittany Lions and former Tiger head coach Guy Gadowsky. The men's hockey team is entering its own crossover season, and it has nothing to do with the time of year. Princeton has crossed over from being an underdog to a favorite, and the Tigers now have to deal with heightened expectations. Ron Fogarty, like Gadowsky did when it was his time a decade ago, has done a remarkable job in putting Princeton men's hockey on the national landscape. In a very short time, Fogarty has taken a team that was 12th out of 12 in the ECAC and turned it into the league champion. If you recall last year, Princeton tore through the ECAC playoffs, defeating the top three seeds along the way to the title and NCAA tournament berth. Princeton has now won three ECAC men's hockey championships - in 1998, 2008 and 2018. There isn't a player on the team now who is content to let a bunch of kids who are just learning to skate now grow up and keep the streak alive in 2028. No, Princeton has tasted success, and it has the team now to build on that. And TigerBlog isn't the only one who has noticed. Princeton was picked 12th in the league two years ago. Last year it was seventh, TB believes, when the Tigers were a fun upstart who could possibly scare a team or two but wasn't really considered a real threat. This year? Princeton is preseason No. 2 in the ECAC. There isn't a national poll that doesn't include the Tigers. There are those who have projected a Frozen Four appearance. The reason for the optimism starts with four players - the three who figure to be in the NHL at this time a year from now (Max Veronneau, Josh Teves, Ryan Kuffner) and the goalie who was the MVP of the ECAC tournament as a freshman (Ryan Ferland). Those four are not the only pieces in place of course. And so the big question now is how will Princeton handle such prosperity and expectations? Every team Princeton plays knows it's playing an NCAA team from last year. Everyone will want a shot at the Tigers. That is, however, a fun position to be in for a team. At least it's better than being an afterthought. Baker Rink has always been a fun place to watch a game. This year, it'll be even more so. The home opener is against Union and RPI on Nov. 9 and 10, after a trip to Harvard and Dartmouth next weekend. For Princeton men's hockey, that'll be the case even after fall sports are done. The Princeton women's soccer team moved back into the national Top 25 this week, checking in at 24th. The Tigers appear to have righted themselves after a 0-0 tie with Dartmouth and a 3-2 loss to Brown that seemed to derail the team's chances of an Ivy League title and a return to the NCAA tournament. As you remember, Princeton reached the NCAA quarterfinals a year ago, defeating 21-time NCAA champion North Carolina in the Round of 16. Princeton has games remaining this weekend at Cornell, who is 1-11-1 overall and 0-5-0 in the league. On the other hand, no game is ever a gimme. After that would be a regular-season ending game at home against Penn on Nov. 3. Penn is at home against Brown this weekend. There are still a lot of permutations for the league championship and the automatic bid to the NCAA tournament, but this is a true statement: If Princeton and Penn both win this weekend, then the game in Princeton Nov. 3 would decide who goes to the NCAA tournament. It would be Princeton with a win; it would be Penn with a win or tie. Harvard, in this scenario where Princeton and Penn both win this weekend, could still get a share of the league championship with Princeton or Penn (but not both). In either case, Harvard would not get the tiebreaker for the automatic NCAA bid. Of course, as TB said before, no game is a gimme. If Princeton loses to Cornell, for instance, it has no chance at a championship unless Penn also loses, regardless of what Harvard does. Princeton, with an RPI of 26, is still very much in the running for an at-large bid should it not get the automatic bid. In other words, much like TigerBlog said about the men's team yesterday, the women's team has reached the fun stage of the season. How do teams get to the fun stage? How do individual athletes put themselves in positions to win championships? When TigerBlog started working at Princeton, there were no strength and conditioning coaches. TB wasn't paying that close attention to how it all worked, but his sense is that the team coaches were responsible for putting together some sort of program for their players to follow. That seems laughable today, doesn't it? Princeton long ago added a strength and conditioning coach, and then another one. Today Princeton has six strength and conditioning coaches, and training has become as much a science as anything else. The man who really built Princeton strength and conditioning is Jason Gallucci, who was that second coach hired in the department and who, TB believes, took over the department one year later. Now, 17 years later, he has taken on another endeavor, one that has taken athletic performance here and upped it a few levels. Jason is now the Director of Performance for the Department of Athletics. Jason oversees what is now known as Princeton Tiger Performance, and the "PTP" section of goprincetontigers.com was launched yesterday. There's a lot to see on that webpage, and there's a lot going on in the area of performance science. You can read a brief description of the program and see the video announcing it HERE. This is a top priority of Ford Family Director of Athletics Mollie Marcoux Samaan, and you can see in the video just how passionately she feels about the program and its benefits. With a values-based, holistic approach, the program integrates strength and conditioning, athletic medicine, sports nutrition, sports psychology, sports science, leadership development, and supportive campus resources. Based in Jadwin Gymnasium, PTP aims to create the environment and education platforms to help student-athletes reach peak performance in athletics, academics and in life. As Ford Family Director of Athletics Mollie Marcoux Samaan says, the key to Princeton Tiger Performance is that it's not just about physiology. It's tying athletic performance to the values of the department, which are clearly outlined in the "Be A Tiger" program. Princeton has 1,000 varsity athletes, all of whom benefit from the Princeton Tiger Performance initiative. The goal is to tie all of this to the umbrella of "Education Through Athletics" and "Competitive Excellence," which is really what this is all about. For teams like the women's soccer team, who has two championship-defining games in the next two weeks, and all 37 of Princeton's teams, it's the latest in an evolution that 20 years ago didn't even include a strength coach. Today, Princeton Athletics has peak performance down to a science. Since the temperature around here has dipped into the 30s for the first time, TigerBlog might as well start today in Miami. Specifically, he's talking about the game this past Sunday in South Florida between the Miami Dolphins and the Detroit Lions, a game that left him somewhat conflicted. Jim Barlow, the head coach of the Princeton men's soccer team, is a huge Dolphins fan. John Mack, a member of the Old Guard and a track athlete from a long long time ago, is a huge Detroit Lions fan. Okay, John isn't really a member of the Old Guard. TigerBlog just likes to tease him that he might as well be. John is actually from the Class of 2000, and he was a 10-time Heptagonal track and field champ and Roper Trophy winner. As it turned out, the Lions won. It doesn't seem like that long ago that Detroit was getting run over by the Jets on opening night and then were 0-2 and 1-3. Now the Lions are 3-3 and seem to be pointed in the right direction. On the other hand, it also doesn't seem like that long ago that Miami was 3-0 and playing at New England with a chance to go three games up on the then-1-2 Patriots. Now? New England is 5-2 and in first place. Miami is 4-3 and barely clinging to the race. Barlow, who saw his beloved New York Mets struggle through the season, is due a good run by the Dolphins here. As for his own team, well, it doesn't seem that long ago that the Tigers started playing their season at all, and now here they are, with three regular season games to go. It also doesn't seem too long ago that Princeton was down 2-0 to Dartmouth in its Ivy League opener. Going back further, Princeton was 1-3 to start the year before going 3-1 in its final four games before the Ivy season started. Then, back on Sept. 29, Princeton fell behind Dartmouth by that 2-0 score before rallying to tie that one 2-2. It was a huge moment for the team. Since then? Princeton is 4-0-1, which includes three straight Ivy wins. Now, with three weeks left in the race, Princeton is the only unbeaten team in the Ivy League. Not that it's time to celebrate a championship or anything. No, there's a long way to go before that can happen - and as Barlow knows, things can change quickly. Princeton is 3-0-1 in the league, followed by Cornell and Columbia at 3-1-0. Princeton has already beaten Columbia, and next up is a trip to Ithaca to take on the Big Red. Columbia and Cornell meet in the final game of the regular season. The Tigers then finish the season at home against Penn and at Yale. There are too many possible combinations still with the number of games left, and clearly they're all huge. That Princeton is in this position is directly related to its ability to win close games, something that all of its games this year have been, at least until this past Saturday, when Princeton defeated Harvard 3-0 on Sherrerd Field. In that game, Kevin O'Toole continued his remarkable Ivy League run, scoring twice and assisting on the third goal. The performance earned him the league's Player of the Week award. O'Toole, a sophomore, was injured for the beginning of the season, but he has come back to be a huge difference maker for Princeton. In fact, Princeton has scored seven goals in the Ivy season and O'Toole, a sophomore from Montclair, N.J., has either scored or assisted on five of them. Princeton has been opportunistic all season. The Tigers also did exactly what is necessary in Ivy League soccer to be in the race - they got off to a good start, even if the very beginning of that start didn't quite appear to be promising, down 2-0. Now Princeton is assured of playing meaningful games in November, which is the goal when the season starts. Cornell is also a team on a roll, having won eight of nine, with the lone loss in that stretch against Yale two Saturdays ago. Cornell's schedule is also tough, with Dartmouth and Columbia still to go. Princeton's 10 points are one better than Columbia and Cornell. Yale and Dartmouth, both 1-1-2, have five points each. It's not quite a three-team race, but the rest of the league is definitely chasing those three. For Princeton it's a great position to be in, the chased that is. Of Princeton's last 31 games dating to the start of last year, a total of 26 have been either one-goal games or ties. A game like last Saturday's 3-0 win is a total rarity for Princeton men's soccer. A team gets toughened when it goes through that, when every game - and the entire season - can change quickly. Princeton has three weeks left to have that pay off in a big way. It won't be easy, but this team has earned the chance to try. If you're looking for the best individual performance in the Princeton-Harvard football game from Saturday, perhaps it came from Patrick Tewey. Okay, it might be a stretch to give that distinction not to a quarterback or receiver or linebacker but instead to a photographer. Then again, did you see the picture that Tewey took? That's extraordinary. That's not a painting, although it looks like one. It's a picture that Tewey took at Harvard Stadium Saturday. Look what you have here. You have Princeton's players, with their unquestioned leader John Lovett front and center, and you have head coach Bob Surace. Yes, Patrick made it better in Photoshop, but still. This is one of the best pictures TigerBlog has ever seen. As for the game itself, this is the one Princeton fans have been waiting for, and in the end it was the most impressive of the season so far. Princeton's 29-21 win at Harvard was different than any of the five that preceded it this year. Added together, and Princeton sits at 6-0, with four weeks to go in the Ivy League race. The games go in this order: home with Cornell, home with Dartmouth, at Yale, home with Penn. Dartmouth, like Princeton, is 6-0, but there's no point in talking about next week's game now. The Big Green host Harvard this weekend, and so keep in mind these scores from one year ago: Cornell 29, Princeton 28 and Harvard 25, Dartmouth 22. For that matter, Princeton lost all four games last year to the teams it has remaining on its schedule. In other words, there's a lot on the line this week before anyone can consider next week. And for today, just focus on last week, with the win over Harvard. Princeton won its first five games with a familiar formula - the blow out formula. Get up early. Never let it be a game. Princeton's first five games saw the Tigers score at least 28 first-half points, passing 30 in four of them. The starters didn't have to play a down of the fourth quarter, and the outcomes were never really in doubt past the middle of the second quarter. Ah, but as the Tigers churned out blowout after blowout, it was obvious that this wasn't going to last an entire year. There was going to come a game when everything wasn't easy, and there was going to come a game where the starters were going to have to do it for 60 full minutes. That game was this past Saturday. Also, the Princeton offense got most of the attention for being the top scoring and top yardage producing unit in the FCS. The defense received much less attention, but that group was ranked second in scoring defense, which is hardly shabby. This past Saturday at Harvard, it was the defense that carried Princeton. The Tiger D started out by going punt, punt, punt and interception on Harvard's first four possessions. Princeton scored a TD on its first, with a nine-play, 68-yard drive, and it looked like this was going to be business as usual. Harvard then threw a bit of a blanket on the Tigers, holding them to just a field goal in the first half, and when the Crimson finally broke through with a TD of their own, the momentum was definitely with the home team at the break, even if Princeton was up 10-7. Harvard would get the ball three times while the score was still 10-7, and the Tiger defense would not allow a point. There would be three sacks during that time, by three different players - Mark Fossati, Delan Stallworth and Tom Johnson. Princeton then scored a touchdown to go up 16-7 when the extra point was no good, and then Harvard's next two drives were a fumble and a four-and-out, when the Tigers stopped the Crimson on a fourth down at the Harvard 24. Princeton then scored to go up 22-7. Yes, Harvard added two late touchdowns, but the game would have been much different had Harvard gotten the lead in the third quarter. Instead, it was all Princeton D.
It was a team effort, of course, as it always is. For instance, Princeton had seven different players with at least five tackles. The offense got some big plays from its stars too. Jesper Horsted caught 10 more passes for 126 more yards and another touchdown, which would be career numbers for most. Lovett threw for a score in addition to his rushing TD, and Charlie Volker had 94 rushing yards, including a big 49 touchdown run in the fourth quarter. In the end, it was a big win over a good team, and a huge rival, in that team's stadium. It came on a day, for the first time all year, when everything did not come easily. It's the kind of win that championship teams have to have. For now, Princeton is not a championship team. It's a team that's chasing a championship, one with four huge hurdles to go. The one the Tigers just cleared, however, was no gimme. If you want to sum up the whole idea behind Princeton Athletics, let Jim Barlow do it for you. The Princeton men's soccer coach had this to say on the most recent episode of "Beyond the Stripes," which features Tiger senior Jeremy Colvin. "We feel like one of the strengths of Princeton is the ability to pursue your academic goals and athletic goals with equal passion," Barlow says in the video. "Princeton allows you to pursue both at the highest levels without their getting in each others ways." That pretty much captures the whole spirit here. If you want to see the whole video, you can watch it HERE. Colvin talks about his academic pursuits at Princeton and how he's managed to tie them all together. He doesn't mention that in addition to that, he has scored four game-winning goals this year, including two in overtimes. Most recently he had the winner last week at Columbia, which improved Princeton to 2-0-1 in the Ivy League. The Tigers have a huge game tomorrow against Harvard, though just not necessarily where and when you might have originally suspected. The revamped soccer schedule has the men's game first at 3, followed by the women's game at 6. Both games will be played on Sherrerd Field at Class of 1952 Stadium. Originally, the women's game was supposed to be first, so take notice of that if you're planning on attending. And why wouldn't you come to Class of 1952 Stadium tomorrow? In fact, you can spend the whole day there and see three Princeton-Harvard games, all for free, all of which will have a huge impact on Ivy League championships. There are seven Ivy League fall championships at stake, and as the second-to-last weekend of October arrives, Princeton teams are in the hunt for all seven. In fact, the five teams who are playing round-robin or double-round-robin would have no worse than a share of the championship simply by winning out. The other two are men's and women's cross country, both of whom are nationally ranked as the Ivy League Heps championship is just a week away. Those races, by the way, will both be held at Princeton. That's for next weekend though. This weekend features all kinds of events, including the opening of the women's hockey season at No. 2 Wisconsin with games today and Sunday. There's also men's water polo at Iona. As for the current Ivy races, all five teams who are chasing titles have important dates, including four of which are against Harvard. It starts tonight with the non-Harvard game, as Princeton hosts Penn in women's volleyball. The Tigers are tied for first with Yale at 6-1 as they've reached the mid-point of the double-round-robin league format. Up next for Princeton will be a big weekend that starts with the second match against Yale. The Tigers won the first one in four games in Dillon Gym. Princeton has won three straight league titles, including one last year that included a three-game sweep in the playoff match at Yale to get to the NCAA tournament. This year's race isn't quite a two-team race, but Princeton and Yale are both two games up on third-place Cornell (4-3), and no other team is over .500 in the league. As for the Princeton-Harvard games at Princeton, you can read THIS, which TB wrote earlier this week. So that's what's going on in Princeton. The other game is at Harvard, and it's the football game between unbeaten Princeton and a Harvard team that is looking to do in football what Princeton is looking to do in women's soccer. Kickoff in this one, by the way, is at noon, and it can be seen on ESPN+. The Princeton-Harvard game in recent years has been pretty much hit or miss. The teams have split the last six meetings, but that doesn't exactly cover things. Of those last six games, three have been decided by an average of 37.3 points, including Princeton's 52-17 win last year at Harvard Stadium. The other three? Epics. Two overtime games and that game back in 2012, when Princeton won 39-34 after trailing 34-10 in the fourth quarter. Princeton and Dartmouth are both 2-0. Harvard is one of four teams who are 1-1. It makes the math easy. In fact, it's an easy mathematical weekend. Five Ivy League matchups, all five of which are huge. TigerBlog emailed Princeton women's basketball coach Courtney Banghart yesterday asking her when she wanted to do the first podcast of the new year. Last year was Season 1 of "The Court Report," a weekly conversation between TigerBlog and Banghart that proved to be very successful and well-received. When did Courtney want to start Season 2, TB asked her yesterday? He got a one-word answer back: "Now." They decided to start next week instead. Look for Season 2 of "The Court Report" every Tuesday or Wednesday from next week through the end of the basketball season. Last year, there was one podcast each week except for the week between Christmas and New Year's. This year, there should be one every week. TigerBlog is pretty sure that Banghart is more fired up because practice is in full gear and the new season is right around the corner. It's not just the opportunity to talk to TigerBlog each week. She's very good at social media. Banghart is entering Year 11 with the Tigers. After taking two years to rebuild the program, she's been to nine straight postseasons, including seven NCAA tournaments. Princeton had not been to an NCAA tournament before her arrival. This year, the Tigers are the preseason favorite in the Ivy League poll that was released earlier this week. Princeton, who won the league title and the Ivy tournament title last year, picked up 14 of the 17 first-place votes, with two for Penn and one for Harvard. Princeton and Penn women have developed a big-time rivalry over the last few years. It went Penn's way two years ago, when the Quakers reached the NCAA tournament. It went Princeton's way last year, when the Tigers returned the favor. The first two Ivy League tournament championship games were Princeton vs. Penn. The last time that the Ivy League was represented in the NCAA tournament by a women's team other than Penn or Princeton was in 2009, when Dartmouth went. The Princeton men's and women's teams are preparing for openers that are, somewhat stunningly, just three weeks away. The women open on Nov. 6 at Rider and then play at George Washington five days later before the home opener against Seton Hall on Nov. 14. The men open at home on Nov. 9 against Desales, followed by a Nov. 14 game at Lehigh and then FDU at home Nov. 21. Princeton announced yesterday that major changes are coming to Jadwin Gym for the 2018-19 season. You could read about them HERE. There are two major enhancements coming to Jadwin. One, as you can clearly see from the picture, is a videoboard. The process of installing it began the other day as the old scoreboard was taken down, and the new board is currently being assembled. The other change will be new seats downstairs. Instead of the old bleachers, there will be chair-backs on the north and south sides. These two new elements will make a huge difference on game nights. First of all, there will be fewer seats downstairs, so getting one will be at more of a premium. Plus they'll be more comfortable and closer to the court. The videoboard, of course, will be the most noticeable feature. Having a videoboard will immediately change the feel of gamenights for men's and women's basketball. It will make the entire experience come to life more so than it ever has before, beginning with pregame intro videos and then continuing throughout the game with replays, promotions, features and everything else that comes with the board. It'll certainly be a much different feel than years past. In a great way. The construction is in high gear now in Jadwin, as the two projects are both underway. TigerBlog is excited to see how it all looks, but he's pretty sure it'll be really nice. If TB has counted correctly, there are 23 home games between the men's team and the women's team this season. That's a lot of chances to come see the new, improved building. Speaking of Jadwin, this January will also mark the 50th anniversary of the first game ever played there. That was on Jan. 25, 1969, when Princeton defeated Penn 74-62. Now, at 50, the building is getting a makeover. The NBA season began last night with two games. TigerBlog works with two of the world's biggest Philadelphia 76ers fans, his Office of Athletics colleagues Craig Sachson and Warren Croxton. You can actually make that three huge Sixers fans, since Princeton's head football coach, Bob Surace, is also one. Interestingly, Croxton is the only one of three who roots for the Phillies. Craig is a Twins fan, and Surace loves his Yankees. During NBA season, they all hang on every Sixers game. It was rough for a few years there, though all that has changed as "The Process" that everyone trusted has started to pay off. Now, instead of worrying how, say, the New Orleans game will impact Philadelphia's chances in the lottery, now there can be legitimate talk of not only making the playoffs but also making a deep playoff run. The Sixers are an easy team to like. Their players are young and good, and they also come across as, well, not jerks. They're also led by a player, Joel Embiid, who 1) is the kind of player you can build championships around (as long as he's healthy) and 2) looks like he's having more fun playing than any player TB can remember since possibly Magic Johnson. TigerBlog has always been a fan of the New York Knicks. It's been a rough go for the Knicks for awhile, though like the Sixers the Knicks finally appear to have a plan (a process, if you will) that they're willing to stick to and a chance to be really good soon. The 2018-19 season starts for New York tonight, when they host the Atlanta Hawks. The Knicks have won a single division title in 20 years and have not made the NBA playoffs since the 2012-13 season. They also have had a series of players of late whom TB will describe as "unrootable," though that should really be "unrootable for," which doesn't sound quite right. TB grew up a Knicks fan, and among his earliest sports memories - along with the Miracle Mets of 1969 - are the Knicks' two NBA titles in 1970 and 1973. 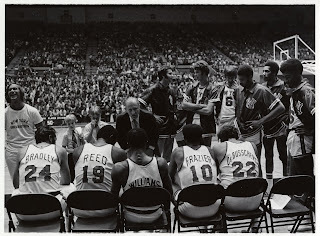 He knew all about Red Holtzman and those great Knicks teams, led by Willis Reed, Walt Frazier, Dave DeBusschere, Earl Monroe and of course, a certain 6-5 forward whose college exploits TB would come to know a lot about. TigerBlog has seen a picture of the Knicks during an exhibition game in Jadwin Gym, and it dawns on him that if that was the only time the team played an exhibition game there, then it was also the only time Bradley every played in the building. Princeton played its home games in Dillon Gym when Bradley was here. Bradley's presence on those teams gave Princeton a connection to the glory days of the Knicks. Now there's another Princeton connection as these Knicks try to recapture that magic. Steve Mills, Princeton Class of 1981, is the team president. He and the rest of the team's front office - which includes Craig Robinson, the two-time Ivy League Player of the Year and 1983 Princeton grad, not to mention the father of last year's first-team All-Ivy League women's player Leslie Robinson - and coaching staff seem to have gotten away from the "let's find the biggest stars we can find and not worry about whether they can defend anyone" philosophy that has plagued the franchise lately and now are going down an actual rebuilding path. TB has heard for years that the Knicks couldn't really rebuild because fans wouldn't want to come to see a team that didn't have some star power to it, and TB has always believed quite the opposite. Knicks' fans, like TB, want a few things. First, they want a team that will play hard. Second, they want a team that is a semblance of an actual team, one that is well-coached, one that plays together, one that isn't all about who scores the most points. This team probably isn't a playoff team just yet, but there a few young pieces and a head coach - David Fizdale - who seems to have the makings of someone who can bring out the best in a team. Also, the team will have a lot of salary cap space this year and possibly next, and while it looks like Lebron James will never be a Knick, who knows who might be. Bring in the right free agent and get a good lottery pick, and you'll have something. As for Mills, TigerBlog can tell you that he's a down-to-earth, friendly guy who always greets you with a smile and a handshake. He's incredibly proud of his Princeton roots and the time he spent playing for Pete Carril here, and he has been a very loyal supporter of the program. TigerBlog listened yesterday to a podcast done in conjunction with the Association of Black Princeton Alumni that featured Steve Mills. You can listen to it HERE. 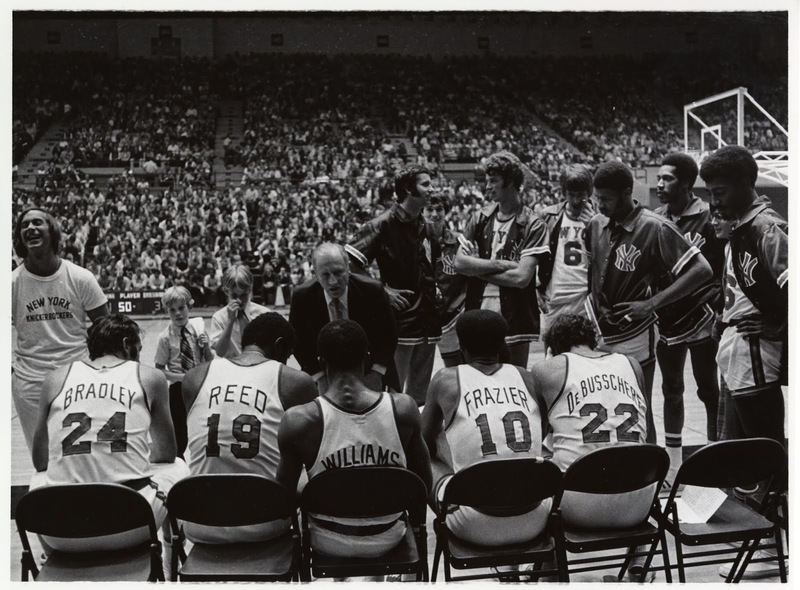 In it, Mills talks about his experiences as a basketball player here, what Carril said to him as he recruited him, how he came to work in professional basketball and of course his current role with the Knicks. The interviewer, by the way, is former Princeton football, basketball and track letterwinner Isaac Serwanga. Listen to the podcast. And go Knicks. Steve Mills alone makes them Rootable. TigerBlog received several emails and texts yesterday about his "Two Truths And A Lie" statements. The basic summary is this: Nobody believed TB's ability to recite the entire "Cat In The Hat" from memory was a lie. What does this say? Either people who know TB think that there's nothing odd about the fact that he would memorize an entire Dr. Seuss book or that it was just too absurd not to be true. Why would someone make that up, of all random things? As for the eight time zones in which he's seen Princeton teams compete, they are the four time zones in the Continental US, Hawaii (men's basketball in 1998), the Atlantic time zone (men's basketball played Ohio in Nova Scotia the day of Thanksgiving 1999), Spain (men's lacrosse trip in 2008) and Ireland and Portugal (Ireland in 2008, Portugal in 2016; both in the same time zone). And yes, he never dunked a basketball. The closest he came was sort of dunking a tennis ball on a basket that was a little bent forward. This doesn't take into account the eight-foot baskets that used to be on a court in Belmar or the adjustable basket that went from six feet to 10 feet in the driveway. So that's "Two Truths And A Lie" for this week. There won't be an edition this week on the Princeton Stadium video board because the football team is at Harvard Saturday in a huge game. Actually, when you're 5-0 and playing for a championship in the next five weeks, they're all huge. Because of the schedule change, this will be the second straight year Princeton plays at Harvard. 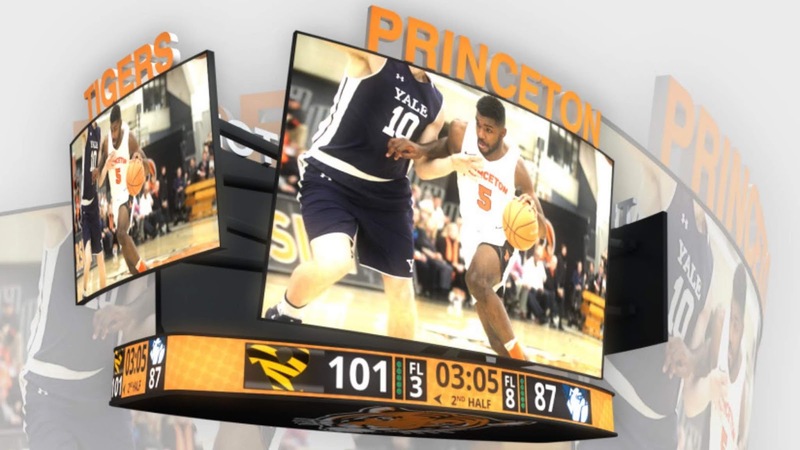 After this, Princeton will have four games to play, three at home and one at Yale. One thing that will be missing from this new scheduling is the Saturday where there are field hockey and two soccer games on the campus, along with the football game. While football is in Cambridge, those three will be playing at home. And they're all huge, huge, huge games. Let's start with the women's soccer team. Princeton got a big win over Columbia Sunday, moving the Tigers to 2-1-1 in the league. The Tigers are in third place, behind Penn and Harvard, both tied at 3-0-1. Princeton still has to play Cornell and Penn after Harvard, which means that should Princeton win out, it would be 5-1-1. That would also be the best possible record for Penn and Harvard, who under this scenario would have to lose to the Tigers. Since Penn and Harvard have already tied each other (0-0), then Princeton would have the NCAA tiebreaker against both. Of course, it's not that simple. Dartmouth, whom Princeton tied 0-0, could also get to 5-1-1, since the Big Green are the same 2-1-1 as Princeton. To get to 5-1-1, Dartmouth would need to beat Harvard, but the Big Green have already lost to Penn. If all that happened, NCAA bid tiebreakers could get a little messy - or even messier if Columbia gets to 5-2. To keep it very simple, Princeton needs to keep winning. On the men's side, the race is one week behind the women's, as each team has played three games. Princeton, who had a big win over Columbia Saturday, sits at 2-0-1. Dartmouth, whom Princeton tied 2-2 after trailing the Big Green 2-0, is also unbeaten at 1-0-2. Columbia and Cornell are 2-1-0. Princeton is 6-1-1 in its last eight after a 1-3 start. The Tigers are used to playing close games; of their 12 games, one has been a tie, 10 have been one-goal games and the other two have been two-goal games. It's a little early to start with all of the scenarios on the men's side in standings that are still very much bunched, but Princeton has done itself a lot of favors with its strong start to the league season. As for the field hockey race, this one could be the simplest of them all. Here is Princeton, ranked third in the country and 4-0 in the Ivy League after its 8-0 win over Brown. The Tigers have not allowed an Ivy League goal yet while scoring 20 of their own. And here comes Harvard, ranked ninth in the country with a record of 12-1 that includes only a loss to Maryland. The Crimson are also 4-0 in the league, having outscored their four opponents 19-3. They also come into the game off an 8-0 league win, this one over Cornell. There will still be two more weeks of the season after the Tigers play Harvard Saturday, and Princeton still has to play Penn, whose only league loss is to Harvard by a 2-1 score. Still, this is obviously a big game. So that's three games at home Saturday, all against Harvard, all for free. Don't worry. TigerBlog will remind you about them later in the week. There are some fun promotions run off the videoboard at Princeton's home football games. One of them is "Two Truths And A Lie." You know this one. People give three facts about themselves, but only two of them are actually true. Then someone else has to try to figure out which one isn't true. As it applies to Princeton football, a player is shown on the videoboard giving his three facts. The contestant on the field has to guess which one isn't true. You think about that. TB will give you the answer later. Meanwhile, here's also one where a contestant is asked a question and then has to give as many possible responses to it. Then a player is shown on the board answering the same question. Whoever gives more answers wins. The question from the game Saturday against Brown, a game Princeton would win 48-10 to get to 5-0, was this: How many pizza toppings can you name? When TigerBlog used to ride with the men's basketball team, back when he was in the newspaper business, the team would often get postgame pizzas delivered to the bus. TB and Sean Jackson, the 1992 Ivy League men's basketball Player of the Year, would split a mushroom pizza. TB is fine with mushrooms. And peppers and onions. Red peppers more than green, but either way. And sausage. And meatball. Or sausage and meatball. Or chicken parmigiana. You know what TB can't stand on pizza? Pineapple. And both the contestant on the field and the Princeton player said "pineapple." TB had to call them out about the pineapple situation over the Princeton Stadium PA system afterwards. Of course one of them also said marshmallow. What's up with that? The promotion came, TB believes, in the second quarter of the game. The "Two Truths and A Lie" came in the third. The TB answer, by the way, is that he's never dunked a basketball. By the end of the first quarter, Princeton led 14-0. By the middle of the second, it was 28-0. And so what if this marked the first time that 1) Princeton didn't score 30 points in the first half and 2) a team scored against Princeton in the second. Neither was a factor on this day, when Princeton dominated from start to finish. The key play of the game was the first one. Brown won the toss and deferred, which gave Princeton the ball. After the kickoff, out came the Tiger offense, the one ranked No. 1 in the FCS in scoring and total yards per game. This time, though, John Lovett, the one with the keys that start that offensive engine, was not out there. Instead, it was Kevin Davidson, a junior from Danville, Calf., in the driver's seat. And what happened on that first play? Davidson threw a beautiful deep ball to Stephen Carlson for 39 yards, and the Tigers were in business. It took six more plays to get into the end zone on a pass from Davidson to Ryan Quigley, and Princeton was off and running. Davidson would throw for 304 yards and four touchdowns, and Carlson and Jesper Horsted combined for 296 yards and 21 receptions, three of those for TDs. The highlight play was a 62-yard strike from Davidson to Horsted for the second score of the game. Horsted ran a crossing route, Davidson threw one that led him to the sideline and Horsted snagged it out of the air and turned the corner, beating a Brown defensive back who appeared to have an angle on him. Really, though, that first play was huge. Davidson, presumably, had some nerves for his first start, and the entire team probably wondered how it would play out without Lovett, who had been completely dominant through four weeks. All of that, any uncertainty at all, was gone after that first pass. TigerBlog actually can't remember too many moments like that, actually, where he could pretty much feel an entire team exhale and get down to the business as usual. For Princeton, business as usual through the first half of the season has meant five games like this one - games that were over before the fourth quarter. That's been the story of the first half of the year. The story of the second half of the year will be decided by the next five weeks, beginning this Saturday at Harvard. Right now, Princeton and Dartmouth are both 5-0 and have both followed somewhat similar scripts. Those two meet on Powers Field on Nov. 3, after the trip to Cambridge and a home game against Cornell. In other words, there's no sense looking ahead to Dartmouth yet. As for Week 5, it was a great all-around team performance again, especially from Kevin Davidson in his first career start. The turning point of the game doesn't always have to wait. On this day, it came on the literal first down. TigerBlog walked from Jadwin Gym to the Shea Rowing Center Wednesday for the Erik Wiehenmayer luncheon. As an aside, among other things this week, TigerBlog has learned the correct spelling for "Wiehenmayer." At least he thinks he has. That's correct, right? It's not a very far walk from the gym to the boathouse. Plus, TB had a great parking spot in Lot 21, something that doesn't happen much these days. When he left the talk, he walked out with Bob Surace, the head football coach. Surace then offered TB a ride back to Jadwin, and TigerBlog took him up on it. When they got back to the parking lot, it was basically jammed. Surace very calmly drove row by row, hoping to find a spot, until he and TB found the very last spot available, all the way in the last row before FitzRandolph Road. Keep in mind that this is the head football coach. TigerBlog doesn't imagine that, say, Urban Meyer ever parks in the very last row and walks in. And if he does, he doesn't simply shrug it off while being happy that he got a spot at all. That's one side of Bob Surace. Another side is his success as a coach. Remember when TB wrote about the number 42 recently? Well, he still has 42 on his mind today. Actually, this time it's 42-42. That would be Bob Surace's record as a head coach at Princeton. This is the third time Surace has been at .500 for his Princeton career. The first was in Week 2 of the 2010 season, when Princeton defeated Lafayette that week 36-33 to get Surace to 1-1 at Princeton. From that point, as he began the process of building the team his way, he would win one of the next 20 games, which would leave him at 2-20 early in the 2012 season. Since then? Well, he's 42-42 now, so that would make him 40-22 in the last 62. That includes a pair of Ivy League championships, not to mention a 4-0 start to this year. TigerBlog has mentioned this before, but what Surace has done is similar to what great coaches like Courtney Banghart and Bill Tierney have done at Princeton - erase deep holes early in their careers to get back to .500 and beyond. If you're looking forward to 43, that opportunity, and the chance to get over .500 for the first time in his career, comes tomorrow, when Princeton hosts Brown at 1. Princeton is 4-0, 1-0 in the Ivy League. Brown? The Bears are 0-1 in the league, 1-3 overall. The win is against Georgetown two weeks ago. The Ivy loss was home against Harvard, 31-17. Princeton and Dartmouth (2-0, playing Sacred Heart tomorrow) are the lone unbeatens in the league. They meet at Princeton in Week 8. By the way, it didn't dawn on TigerBlog until early this week that the Sacred Heart-Penn game last weekend matched his alma mater with his son's soon-to-be alma mater. Also by the way, if you didn't check out that game, Sacred Heart trailed 24-0, took the lead 27-24 and then lost 31-27 as Penn drove for the winning TD with 1:19 to play. For your final by-the-way, Sacred Heart is in the middle of playing three straight Ivy teams. The Pioneers lost 43-24 to Cornell in a game that was never close and then had the close one against Penn that was only close for a little while. Next up is Dartmouth. Other than the fact that Princeton and Dartmouth have been very impressive, what do any of the results suggest so far? You can play with the results all you want, but the reality is that the sample size is still a bit too small. What does the fact that Cornell thumped Sacred Heart but Penn barely won that game, that Sacred Heart and Penn both beat Bucknell and by nearly identical margins (16 and 17) and that Harvard was two touchdowns better than Brown but lost to Cornell, who lost to Yale, who lost to Dartmouth? TB supposes that everyone will find out soon enough. This is Week 5. At the end of the day tomorrow, all eight Ivy teams will have played three non-league games and two league games and have five league games to go. No matter what, Princeton has some big football games to play in the next few weeks. And it's also true that every game is big now. The Tigers are off to a great start. They're led by a coach who took the long way back to being even. Don't let the fact that he was happy to walk from the last row of the parking lot fool you. He may not have a big ego, but he has a big competitive streak. Surace got to .500 last year at 38-38 before the Tigers dropped their last four. Now the 4-0 start has him back to even. TB is positive he never wants to be below .500 again. TigerBlog has known Eddie Timanus for a long time. Eddie is a USA Today writer - and five-time Jeopardy champion - who covers national men's lacrosse. One of TigerBlog's favorite things on Twitter, other than Princeton Athletics highlights, is Eddie's song lyrics as he says goodnight to the "Twitterverse" each night. He also seems to go to bed rather early, but that's okay. TigerBlog can usually figure out the song, since Eddie leans heavily to the classic rock genre. Eddie's a good man. He often tweets about his son, whom he refers to as "da kiddo," and his cat, as well as Final Jeopardy questions and of course college athletics. As the Twitterverse goes, Eddie brings a refreshingly wholesome approach. Among Eddie's great gifts is his sense of humor, which he displays easily in person and which will come through on Twitter. In fact, he'll often make some fun of himself regarding one feature that TB has neglected to mention yet. Eddie Timanus is blind. When TB sees him at the NCAA lacrosse championships each year, or during the season at some point, Eddie is accompanied by his father Chuck, who serves as his guide. And as his eyes at the games. TigerBlog thought of Eddie and Chuck as he watched another blind son with his father yesterday. This time it was the amazing Erik Weihenmayer and his father Ed. Erik was the featured speaker at last night's Princeton Varsity Club Jake McCandless Speaker Series event. It was the second time Erik has spoken, as he also did so in the same building back in 2005. This time around, Erik reminded TB of why he remembered him as such a great speaker. From the first second he starts to talk, he just grabs the entire room, which hangs on every word he says. It doesn't hurt that his story is amazing. He's blind, and yet he has not allowed that to slow him down at all. Erik spoke about the way his father - a Princeton football captain, member of the Class of 1962 and Marine Corps fighter pilot in Vietnam - encouraged him not to let his blindness stop him from doing the things he wanted to do. Ed spoke about how parental instincts want you to protect your children from danger but this was more important. And so, with his father's guidance, Erik set off on a lifetime of adventure that would be difficult to conceive for anyone, let alone a blind man. In his lifetime Erik has climbed the "Seven Summits," which represents the tallest mountains on each of the seven continents. He has run marathons. Most recently he has kayaked the 70 rapids of the Grand Canyon. He talks about these achievements as if they're commonplace, no big deal for a blind guy or anyone else. * while showing a video of his whitewater rafting in the Colorado River at the Grand Canyon: "What did I learn? I learned why there aren't a lot of a blind kayakers." * a few moments later, when he disappeared briefly under the water of the rapids: "Don't worry. He lives." * just before the video, as he asked how many people in the audience had ever been to the Grand Canyon: "don't raise your hands." * responding to a question about the team he worked with to help him get to the top of Mount Everest: "They were going to bring me 100 yards up and say we were at the summit and save us all a lot of work. Weihenmayar has a foundation and a book both entitled "No Barriers," and it's somewhat self-explanatory. He finds no barriers in the world, and his foundation takes that spirit and uses it to literally change the lives of so many people who might otherwise have given up. When Erik speaks, he talks about this friend and that friend, all of whom have had catastrophic events in their lives, all of whom refused to be stilled by them, all of whom have gone on to push through any way they could. It's one inspirational tale after another, all with Erik Weihenmayer as the point person. There was a great moment at the luncheon, during a Q&A session after Weihenmayar's short talk there. One of the people in the audience was football player Joe Percival, whose mother has lost most of her vision. If you missed the story about the Percival family, try HERE and HERE. His mom, Joe said, was taking up marathon running. There's nobody better than Erik Weihenmayar, of course, to give him and his mother advice. There's nobody better than Erik Weihenmayar to inspire her. There are no barriers in his world. Why should there be barriers in anyone's? There are few people at Princeton easier to like than Joe Dubuque, associate head coach for the wrestling team. The wrestling room is next to the Office of Athletic Communications on Jadwin's E Level, so TigerBlog has considerable opportunities to see the coaches. They're all great guys. Joe, a two-time NCAA champion at Indiana, came in two days ago to excitedly talk about the "Vision Quest" spoof that the wrestling team had put on social media. He came in yesterday to mention that Matthew Modine had responded to the tweet that had the video in it. Modine was the one who played Louden the love-struck high school weight-losing wrestler in the movie itself. This was big. Modine is a major Hollywood star, and here he is, retweeting Princeton wrestling. Modine has been in a lot of movies, but his best has been his role as Private Joker in "Full Metal Jacket." That's as intense as movies get. TigerBlog thinks that "Full Metal Jacket" is a better movie than "Platoon," which won Best Picture back in 1986. As far as Vietnam War movies go, he gives "Full Metal Jacket" the edge over "Apocalypse Now" as well, though there is a long way to go between any of those and "The Deer Hunter." He was also great as the pilot in "Memphis Belle," which is a very underrated World War II movie. It's about the crew of a B-23 that needs to fly one more mission before it can become the first crew to fly 25 combat missions, only the last one is really, really difficult. And there's a movie crew that is trying to tell a glorious story, even if it's insensitive to all of the tragedy around them. And now, most famously, he has retweeted Princeton wrestling. And commented. If you're looking for star power, albeit less well-known star power, TigerBlog can refer you to tonight's Princeton Varsity Club Jake McCandless Speaker Series event featuring Erik Weihenmayer. The event will be held tonight in Richardson Auditorium at Alexander Hall, at 7:30. It is free and open to the public, but tickets are required. You can get yours HERE. This will actually be Weihenmayer's second appearance in the series, which TB believes is a first. His previous talk was back in November of 2005, and TB was at it. Weihenmayer was born with retinoschesis, which gradually causes the retina to deteriorate. He had partial sight through his childhood before losing his vision completely at age 13. So what's his talk about? How that limited the things he could do in his life and how he came to be okay with that? His talk is entitled "No Barriers," and it's very applicable, as nothing in this world has been a barrier for Erik Weihenmayer. Not the highest mountains. Not running marathons. Not whitewater. Nothing. There aren't too many people more accomplished, more adventurous and more courageous than Erik Weihenmayer. He's climbed the highest peak on all seven continents - the "Seven Summits" - something that fewer than 400 people have ever done. In addition, he and his father Ed, a 1962 Princeton graduate and a fighter pilot during the Vietnam War, biked from Hanoi to Ho Chi Minh City, Vietnam, with 75 others, most of whom were veterans of the war. And he's done it without his eye sight. The first time Erik spoke at Princeton, he talked about his climb up Mount Everest. That's scary enough with your vision. Beyond just the mountain climbing, Erik has recently kayaked the Grand Canyon and its 70 rapids. Again, he's done that blind. TigerBlog was here for Weihenmayer's first talk, and he was simply riveting. He's pretty sure tonight's talk will be as well. The title of his speech is also the name of his foundation, which encourages thousands of challenged people each year to share his spirit. He has worked extensively with wounded war veterans as well. You can see a lot more information about what "No Barriers" is all about HERE. From the website: "Our mission is to unleash the potential of the human spirit. Through transformative experiences, tools and inspiration, we help people embark on a quest to contribute their absolute best to the world. In the process, we foster a community of curious, brave and collaborative explorers who are determined to live the No Barriers Life." Jeez. Does it get any more impressive than that? TigerBlog said he'd start with the number 773 today, and so he will. Princeton gained 773 yards of total offense in its win Saturday against Lehigh. That's the most Princeton has ever had in any game, dating all the way back to the 1800s - though TB has never seen a stat sheet from the 1869 games against Rutgers or anything. That's a lot of yards. That's nearly a half a mile of offense in one game. The result was the most points Princeton has scored in a game since 1934, when the Tigers defeated Amherst 75-0. There was also a 66-0 win over Williams in 1950, which equaled the number of points the Tigers had Saturday. And with that, TigerBlog will get back to football in a few seconds. First, he wants to share with you this video from the wrestling team on Twitter. TigerBlog got the reference immediately. If you were between, say, 15 and 25 in 1985, you probably got the reference too. It's a play on the movie "Vision Quest," which came out in 1985. It's classic mid-1980s, with Matthew Modine as a high school wrestler who drops down two weight classes to go up against the three-time state champion, all while falling in love with the older Linda Fiorentino (whose character was from, of all places, Trenton, N.J.). Yeah, throw in some Madonna songs, like "Crazy For You," and you have a classic. And now the wrestling team - the always creative wrestling team - has taken it up a few levels. And now TB can't get "Crazy For You" out of his head. In fact, he just started whistling it. Okay, now back to Princeton football. Princeton currently ranks first in the FCS in scoring offense (53 points per game) and total offense (607.2 yards per game). Princeton is also second in scoring defense (8.3 points per game), seventh in total defense (260.8 yards per game) and eighth in rushing defense (88.0 yards per game). * Princeton has scored 212 points this season through four games. The last time Princeton scored that many in the first four games was 1888. Yes. 1888. * Princeton has allowed 33 points in four games. The last time Princeton allowed that few through four games was 1987. * Princeton has not allowed a second-half point. * Princeton has allowed 33 points through four games. There are four players - Nicolas Ramos (40), Jesper Horsted (38), Charlie Volker (36) and John Lovett (36) - who have scored more by themselves. * Princeton has scored a touchdown on 28 of its 46 possessions. Of the other 18, eight have ended in field goals and three ended with the end of a half. And then there's the one that TB gave you yesterday - Princeton has played eight halves and has scored at least 30 points in five of them. What does it all mean? Right now it means that Princeton is 4-0, with six Ivy League games to play. The next one is Saturday, at home against Brown. Princeton is one of four unbeaten teams in the FCS, along with North Dakota State, Colgate and Dartmouth. Princeton and Dartmouth are the only two Ivy teams without a league loss. In case you forgot, Princeton and Dartmouth will not meet in the final game this season. Instead, they'll play on Powers Field on Nov. 3, in Week 8. That's a long way from now. All Princeton can do is focus on the next opponent, which in this case is Brown, a team that lost its Ivy opener to Harvard and is playing to get back into the league picture. This weekend's game is part of Alumni Weekend, which is also a change from year's past, since it won't be Harvard or Yale, both of whom are on the road this year. This game is also the halfway point of the season, and it's the start of that six-game sprint to the finish. What will it look like when the season ends? The season record for points (in the modern era) is 437. That means Princeton needs to average 37.5 the rest of the way to match that. Will that record fall? Will this be a championship season? There are still more questions than answers. Through four weeks, though, this is a team that has been a lot of fun to watch and has been playing at a level in all phases of the game that few before it here have matched. Should TB bother to work in something about how it's a team that Princeton fans can be crazy for, or does that just go without saying? The Giants, it turns out, reached the 30-point mark for the first time in 37 games when they got to 31 against the Panthers yesterday. Then it all turned out to be all for nothing, as Graham Gano drilled a 63-yard field goal as time expired, giving his team 33. Princeton, on the other hand, has reached the 30-point mark every game so far this season - in the first half alone. In fact, Princeton has played eight halves this year and has scored at least 30 in five of them. TigerBlog last week talked about the No. 42. He figured he'd be starting out this week with the number 733 - but that's going to have to wait a day. Usually, Mondays this time of year here feature something about that weekend's football game. TigerBlog will get to that this week as well, except he'll be doing it tomorrow. Today? The number is 79. Yes, 79. And not 80. TigerBlog will get to that shortly. Today, though, TigerBlog starts with the women of Princeton. If you pay attention at all to Princeton information, then you know this past weekend was the "She Roars" event, which brought 5,000 women alums back to campus for a series of celebrations, discussions and lectures. If you haven't been to the Princeton social media feeds, it's definitely worth checking out. The featured guests were Supreme Court Justices Sonia Sotomayor and Elena Kagan, both Princeton alums (as is fellow Justice Samuel Alito), who spoke in Jadwin Gym Friday night. There were many other highlights, and they have been chronicled in depth on the University's Twitter, Instagram and webpage. As for athletics, Princeton's Ford Family Director of Athletics Mollie Marcoux Samaan hosted a roundtable entitled "Be a TIGER: Optimize Performance and Wellness." Joining Mollie in the discussion Saturday morning were women's open rowing coach Lori Dauphiny, women's hockey coach Cara Morey and women's lacrosse coach Chris Sailer. The focus of the talk was, as the title suggested, advances in performance training, including the use of technology and analytics to enhance performance. There was also a large chunk of time devoted to the importance of building strong team cultures. Oh, and in the beginning, Mollie talked about the overwhelming success Princeton's women's athletes have had since the earliest days of competition back in the early 1970s. TigerBlog ran through it last Thursday, with some facts and figures to document that success and then a timeline. You can see it HERE if you missed it. There was also a well-attended reception after the women's soccer game on Sherrerd Field. And now, there's the number 79, which ironically is connected to a group of women who left campus for the weekend. Still, while they weren't at Princeton, they still did a lot of roaring. The Princeton field hockey team had itself a huge weekend. It started Friday, when the Tigers were at Columbia for a 4-0 win. That victory improved the Tigers to 3-0 in the Ivy League, having outscored its opponents 12-0. That's pretty good. After that the weekend continued with a trip to UConn for a game yesterday. UConn, of course, is no average field hockey team. No, UConn is the defending NCAA champion, and until a week ago, the Huskies were cruising with a 33-game winning streak, one that was snapped in a 4-2 loss to Maryland in a rematch of last year's NCAA final. The game yesterday was Senior Day for UConn, whose current seniors have been to the Final Four each of their first three seasons. And their record since they'd arrived in Storrs heading into the game? UConn was 79-4. That number has stayed at 79, after Princeton stunned the Huskies 5-2. This win was not a fluke either. It's the most goals that UConn has given up in a game in five years. Princeton outshot UConn 17-8, and the Tigers had a 10-5 edge in corners. Clara Roth scored seven minutes into the game, and the game stayed 1-0 until halftime. The second half, then, would feature six goals. UConn would trail 3-1 before scoring to make it a 3-2 game with 20 minutes left. With the game at its crucial point, Ali McCarthy built the lead back to two 20 seconds after the UConn goal and then scored again a little more than three minutes later. Princeton is 10-3 on the season, and five of those wins have come over teams whose RPI was in the top 15 a week ago. Princeton is 2-2 against the top five (the Tigers are fourth), with wins over No. 3 Duke and No. 5 UConn and one-goal losses to No. 1 North Carolina and No. 2 Maryland. Ahead for Princeton are its last five Ivy games, which means two more Top 20 RPI games - against No. 10 Harvard and No. 20 Penn. Harvard is 3-0 in the league (with a win over Penn) and 11-1 overall. Princeton will play one league game a week now, each of the next four Saturdays, beginning this Saturday at home against Brown. Harvard is at Princeton the following week, with a trip to Cornell and a home game against Penn to finish the regular season. The NCAA tournament will come up after that. There's a long way to go for the Tigers, who chase another Ivy title and another run deep into November. This weekend, when all the roaring Tigers were not on campus, was a great one along that road. TigerBlog's belief is that, even in a 280-character world, there's still a place for a well-written feature story. Yes, attention spans are not what they used to be. And yes, the sports media world is more about "the hot take" than it is about long-form writing that really goes into depth to let you get to know the subject. Twitter is the main source of information, and it's easy to get addicted to scrolling through until something catches your eye, for a few seconds at least, until it's on the next. TigerBlog likes how the communications field has evolved in his time here. He's said that often. No matter what, though, he'll always enjoy the challenge of writing a long, engaging, comprehensive feature. His colleague Craig Sachson has now written two this year about senior football players. The first was on Stephen Carlson, the wide receiver, and you can read it HERE. This is before he added two more touchdown receptions against both Monmouth and Columbia. The most recent one is about Joe Percival, whose story is incredible. You can read Craig's feature HERE. TigerBlog doesn't want to give it away, but Percival, a defensive lineman, has had to deal with more in his family situation than most college students, including the fact that his mother - who is thankfully still here - was actually given Last Rites at one point. Read the story. It's worth it. Now, TigerBlog also feels obligated to tell you that the story was the subject of a video feature a year ago. You can see that HERE. Yes, the video gives it more immediacy and all. Still, TB doesn't want you to think he's saying that the video is automatically more impactful than the feature story. Percival will be on the cover of the game program tomorrow for Princeton's home game against Lehigh. Kickoff is at 1. This is Princeton's final non-league game of the season. After this will be six Ivy games in six weeks, including four at home. Princeton is off to a sizzling start. The Tigers are 3-0 and ranked 23rd in the FCS, and none of their games have been particularly close. In fact, the average score at halftime of a Princeton game so far has been 34.7-8.7, which is fairly ridiculous. So is the fact that Princeton has allowed 8.7 points per game, which means that Princeton has yet to give up a second-half point. Princeton scored at least 30 in the first half of every game and average 48.7 per game. The Tigers have not committed a turnover. They have averaged 8.3 yards per play. That's also ridiculous. You want more ridiculousness? Princeton averages 7.7 yards per rush. The average yardage on the ground per game is 323. Princeton ranks second in the country in scoring offense and total offense, third in the country in scoring defense and team passing efficiency and fourth in rushing offense. Were it Week 9, those numbers would suggest complete dominance. Now they suggest a team that is playing really well, with a lot of confidence and depth and with a long, long way to go. Lehigh ranks 110th in the FCS in rushing defense, allowing more than 250 per game, but that's a bit misleading, as the Mountain Hawks have played Navy, as good a rushing team as there is. In fact, the Mids went for just short of 500 on the ground in that one. Lehigh has definitely challenged itself this year, with games against nationally ranked (FCS) Villanova and also most recently against Penn, which the Quakers won 30-10 two weeks ago. The Mountain Hawks had an off week last week, so they should be fresh after that three-game gauntlet. The season began with a win over St. Francis (Pa.). For Princeton, there will be a time this year - lots of them actually - when the score isn't lopsided and outcome isn't decided by halftime. It could certainly be tomorrow. Lehigh has won five of the last six and 13 of the last 17 meetings between the two. As for the league race, everybody has played one Ivy game and two non-league games. Everybody has one of each the next two weeks before it becomes all Ivy games the final five weeks. The four unbeatens are Princeton, Dartmouth, Harvard and Yale. That number falls by at least one this weekend, since Dartmouth is at Yale tonight. Harvard is at Cornell tomorrow in the other Ivy vs. Ivy game this weekend. Princeton will be home next Saturday against Brown, also at 1. For this weekend, it's Lehigh. It's another chance to see a team that's trying to build on an amazing start. And a chance to see, among others, Joe Percival, who is amazing in more ways than just as a defensive lineman.